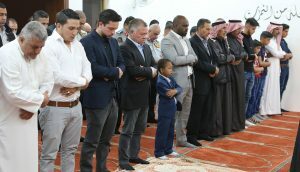 His Majesty King Abdullah and His Royal Highness Crown Prince Al Hussein bin Abdullah II joined worshippers on Tuesday in performing Eid Al Fitr prayer at the Royal Guards Mosque in Aqaba. King Abdullah and the worshippers, who included the families of Fuheis and Salt martyrs, listened to the Eid sermon by Royal Hashemite Court Imam Sheikh Ghaleb Rababah. After the prayer, His Majesty and Crown Prince Al Hussein spent the Eid morning with the families of Fuheis and Salt martyrs. The King expressed Jordanians’ appreciation for the heroism and sacrifice of the martyrs in defence of the country and its security, stressing that the families and children of martyrs always have his full attention and that of state institutions. The martyrs’ families voiced their pride in the sacrifices of their sons to safeguard Jordan’s security, stressing that they stand behind His Majesty’s leadership to protect the country.